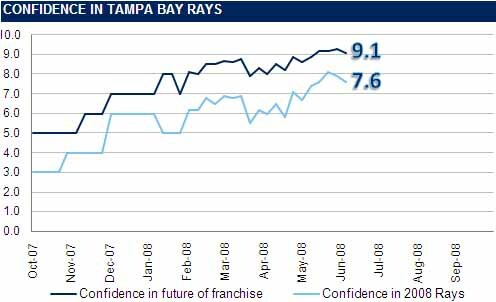 The most common response for “Confidence in 2008 Rays” was 8 (They will be in playoff contention all season) with 55.7%. The most common response for “Confidence in future of franchise” was 9 with 50.7%. 95.7% of respondents feel the Rays have a shot at the playoffs in 2008. That number is up from 94.0% a week ago. 98.6% of respondents feel the Rays should be at least a .500 team in 2008. Last week that number was 98.7%.